In some circles, social media marketers still get a bum wrap for not being able to prove how their work impacts the bottom line. Despite an abundance of overwhelming evidence to the contrary, many business leaders still view social media as a “nice to have” but not a necessity. “We see our competitors employing social media,” they say, “so we use it too.” If this sounds like your place of business or if you are just looking for a better way to demonstrate value from your social media channels, take a look at the four analytics tools to follow. They show how social media directly helps us achieve business objectives. Perhaps more importantly, they give us an indication of what works and what doesn’t when it comes to driving meaningful traffic to a website. 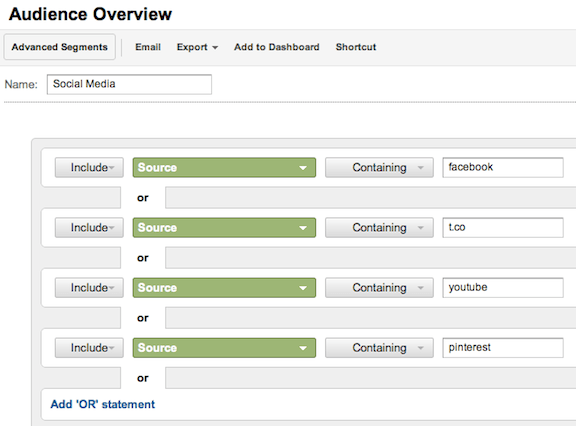 They measure the impact of specific posts published in various social channels. To be more specific, they highlight what content earns shares. Shares are our litmus paper for evaluating content relevance and value. They help us identify the material that resonates with the audience. They allow us to give our message greater exposure. Shares are also the subject of several smart conversations related to search engine optimization. Utilizing the advanced segment features within Google Analytics, we can collect a wealth of information about how each social channel is performing with respect to driving traffic and conversions on a website. The graphic below illustrates a custom segment that includes visits from Facebook, Twitter, YouTube and Pinterest. We can also create similar segments that isolate visits, conversions and other measurable website behaviors from a single social media channel. What It Measures: Traffic, conversions/sales, and other important website events from social media. 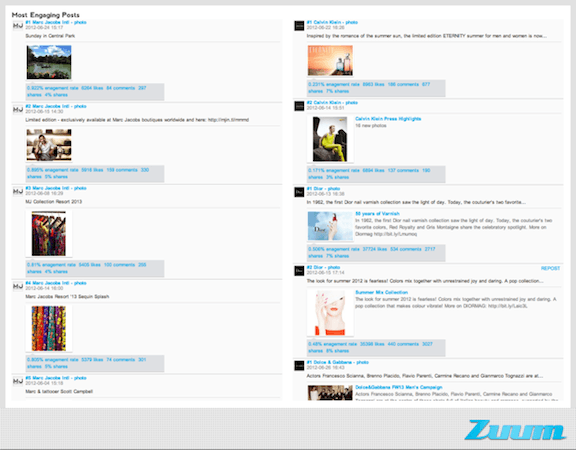 Zuum primarily provides competitive analytics for Facebook pages. Compare up to 10 Facebook Pages over a time period of your choosing. Similar to Facebook Insights, we can also see performance by post to find out which posts earn the most Comments, Likes and Shares. All of the metrics below help us understand the kinds of content we can and should be producing to improve upon share volume. What It Measures: Zuum provides the following Facebook metrics for your Page and up to nine competitors. Post effectiveness by word usage, post type (photo, video, link, status) and time (day and hour). What this tool lacks in interface aesthetics, it more than makes up for in helpful data. Retweet Rank is obviously a Twitter analytics tool. While we can still use Google Analytics or our favorite URL shortener to measure clicks to a website link, Retweet Rank shows us a trendline for retweets, the particular posts that have been retweeted, and a list of the most influential accounts to share our content on Twitter. What It Measures: Here are a few metrics that Retweet Rank provides. It seems Pinterest tools are popping up faster than rodents in a game of Whac-a-Mole lately. One tool that has effectively found a way to measure Pinerest account activity including “repins” is PinLeague. This tool allows you to monitor Pinterest follower growth and repin behavior over a specific time period, and monitor repin quantities for boards and individual pins. The ability to see what specific boards and pins are capable of garnering repins is extremely valuable when trying to source or create new Pinterest content. 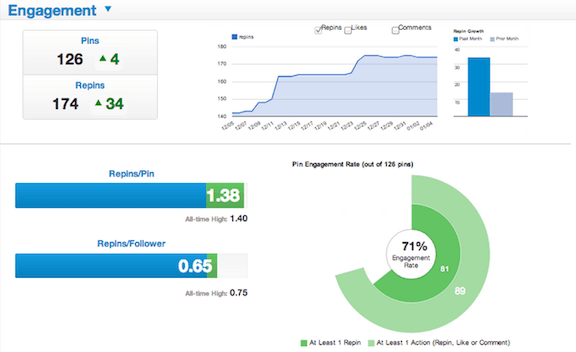 Unlike Retweet Rank, PinLeague does not allow users to measure overall growth in repins retroactively. In other words, when you start your account is when you start your repin trendline. After chatting with a PinLeague rep, I found that this is an issue with Pinterest data, not the tool that houses it. However, PinLeague does allow for a Google Analytics integration so you can measure sales or conversions from Pinterest content. Cost: Plans vary between Free and $99/month depending upon how many competitors you would like to include. Have you used any of these tools previously? What else can you tell us about them? 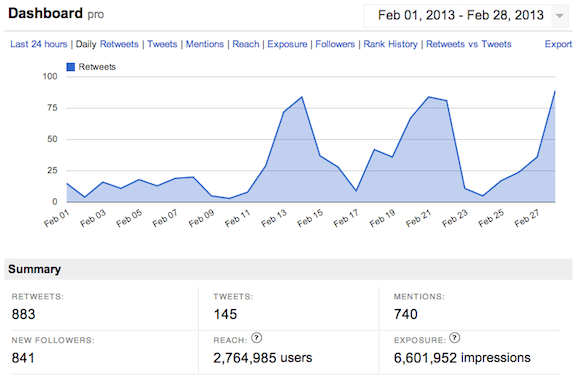 What other social analytics tools do you use to tie social media activity to business metrics?